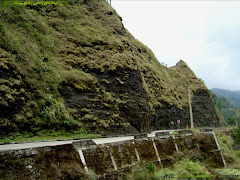 from the Dalton Pass in Sta Fe, we went farther North of Nueva Vizcaya to its capital town Bayombong. 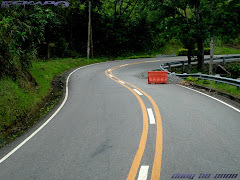 this time we're going downhill passing the town of Bambang. this will be another long drive. it took us two hours to get to Bayombong. climate was still cool there and it continued to drizzle. 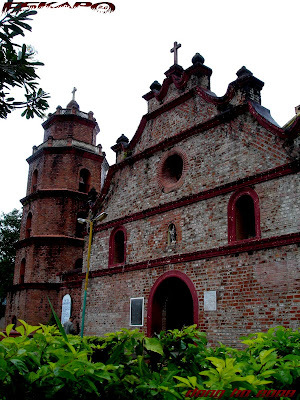 we were here to visit the oldest cathedral of this province, the cathedral of St. Dominic. this church gives me good vibes. maybe because it has a really good name. it was still drizzling but we can't miss out this old yet beautiful cathedral. it's facade survived two fire incidents in the past. from outside, the church looks small, but when you get to see its interior, you'll notice that it is big. the present structure is said to be twice its original size. that proves why the facade is smaller than its main structure. with the new structure, it made the church really beautiful that made me wonder how it looked during the old times. upon what first caught my attention was its wooden chandeliers and ceiling. it's quite rare to find churches with wooden chandeliers. this made it a unique church. but what i'll never forget from this visit are the very friendly volunteers serving in this church. when i asked them about the church and its origin, they enthusiastically shared some of the stories. it simply showed how much they enjoyed serving in this church. we spent a short visit at the town's museum which was just infront the church plaza and had our lunch at the capitol plaza. it rained hard that made us decide to cancel our plan to visit the waterfalls and other sites. thanks to the personnel who allowed me to recharge my camera there. check out other photos of this church from Lawstude's tandem post here. [what you shouldn't miss there]>>> the wooden chandeliers and interior of the church plus the museum just infront of the plaza. the museum has some of the old items of the church and of the town's historical past. 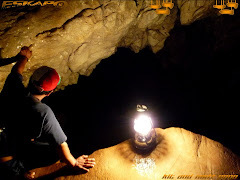 [why i should go back] >>> to explore the whole town and the other churches of this province. plus the waterfalls that we've missed due to heavy rain. Ganda ah. Medyo iba siya kasi may pagka-pula siya. That church - the facade and the interior - really looks grand. How old is it? >earvin, ganda nga pag red bricks. dami talagang magandang simbahan na red bricks ang gamit. 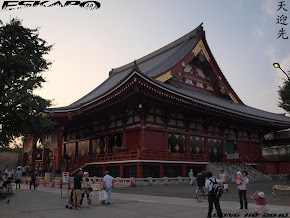 >eki, it was built during the 18th century. rebuilt twice. >hi mimi, dahil dalawang beses na siyang nasunog kaya nung huli nilang pagrenovate, ginawa na nilang malaki dahil dumadami na rin ang nagsisimba. >pusang-gala, magandang roadtrip ang papuntang nueva vizcaya. subukan mo. kaya mataas ang rating ko sa roadtrip papunta doon. dom, the best ang mga shot mo dito. mukhang inspired ka kasi maganda name ng church. medyo hibernation mode muna ko ngayun kasi medyo full-blast na commitments ko sa law practice but i do hope i could go back sooner and continue my posts. as usual, i was here to visit your blog, keep great job dong? That's quite the church. It looks timelessly beautiful inside and out. 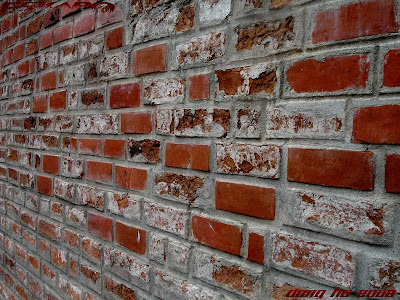 Brick is like that, isn't it? 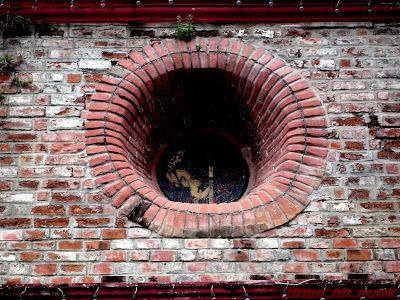 Even very old brick can look new, and yet it can look ancient. A paradox. Thanks for these warm images. the church has a good name. Hehe.. so, Dominic is your real name? I love the old church building! And the surroundings look serene. A stone facade and a wooden ceiling. Wow. I love it! The interior is sure unique, especially the chandelier. First time I come across those type. i love the way you capture them... you've always been consistent with the way you took pictures. its as if each capture has its story to tell. keep it up!have a safe travel always..
>hi reena, hahaha... wala nga ba? >gil, ok ill add you up. >oman, salamat. oo kahit maualan shoot pa rin. ok lang alam naman naming mas importante yan. kitakits pa rin tayo sa mga byahe minsan. good luck dyan attorney oman. >hi sandy, you're right. it's timelessly beautiful. i too love red bricks on structures. >hi teacher vic, hahaha... yes. thanks! >hi eastcoastlife, serene because it was raining during those time. >hi hilda, that's true. somewhat an odd combination. yet still beautiful. >borneo, you'll see a lot of beautiful churches around the country. im sure you'll enjoy hopping. >hi nyl, thanks! i really try my best to present it in a way like you're traveling with us. it's great to know that you find it good that way. nice church... they say pag nakapunta ka sa isang simbahan for the first time, pag nagwish ka daw, chances are it'll come true. All these pictures are very awesome; wooden ceiling, chandelier, park and church structure. You got a magic, dong. when it comes to pictures, i can't help but worship you. nice pictures of old church building and their surroundings ..looks awesome!! Very beautiful of the church. It looked so grand and beautifully built. that's is a nice church. Clean and Neat. love the brick facade of this church. 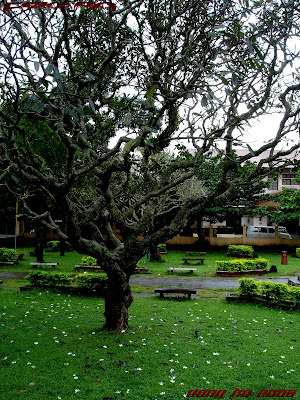 what is that gnarled tree-- a kalachuchi? i like it. Nice pictures. I love old churches. I hope I can visit this one. >hi cyndirelaz, yes. this is the province's capital. the town is already big and it has a good climate. 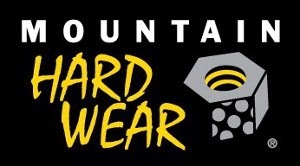 >gillboard, hehehe... hindi ko yata nagawa yon. >hi grace, thanks! beautiful church. >rajesh, thanks! yes it is. >hi alicesg, it's a beautiful church and the climate there is really nice. >victor, that's true. they always keep it clean. just imagine we were there when it was raining yet you can see how clean the church is. >hi luna, i like churches with bricked walls too. yes that's a kalachuchi tree. perfect for the church plaza. the flowers on grass-filled ground looks beautiful. >joe, thanks! 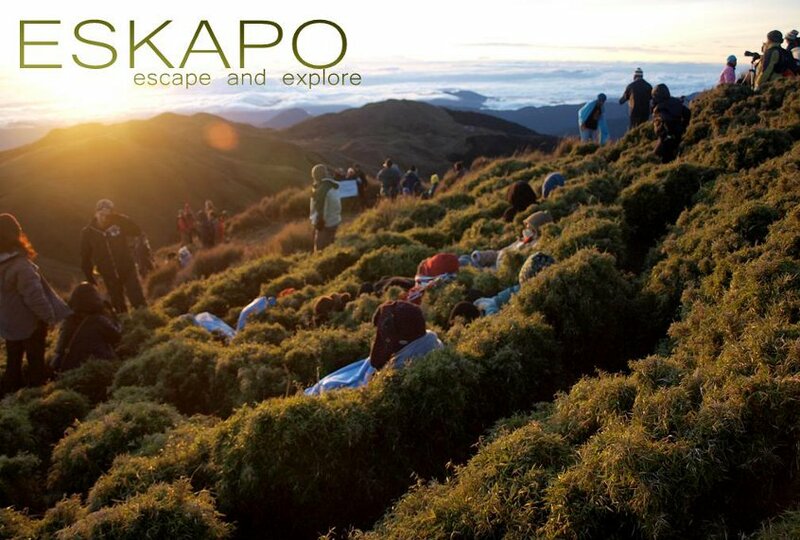 there's a lot to visit around the philippines. 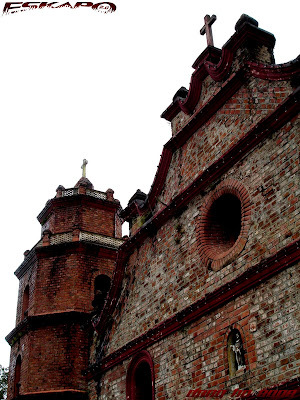 you might want to check some of the unesco world heritage sites of baroque churches in the philippines. >hi cza, truly beautiful! yes perfect for wedding specially for that long dramatic walk. >hi rebecca, hahaha... walang ganyan nga daw sa states. thanks! you too have a greet week. The interior so beautiful and structure too. Perhap the oldest church in this province. Bago pa man ako magmigrate dito sa Toronto madalas akong magsimba dyan kasama mga berks ko. Punung-puno yan tuwing linggo kaya madalas nakatayo na lang kami sa labas. 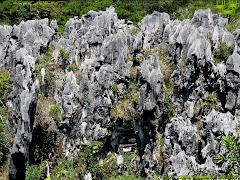 If you get a chance puntahan niyo rin mga caves sa Kasibu. Anyways salamat for featuring my home province. Miss this place. Makauwi nga. di bale, pwede nyo pa naman balikan ni attorney ang waterfalls na iyon sa next nyong byahe..
astig nya yung chandelier..bibihira na nga lang ako makakita ng ganyang klaseng chandelier..
Dong: this cathedral, outside and inside, is absolutely fantastic. Thanks for this unforgettable sequence of views. i must say it has it's own appeal. i am a fan of brick-made churches so I should visit this one of these days. i love your aisle shot, Dom. I can't seem to perfect that shot. the angle is just superb. keep it up. that is one beautiful church! you wouldn't guess from its outside appearance that the interior is that well-maintained. again, thanks for sharing. never would have known this place existed had I not seen it here. Love the shot of the church and the tree! Thanks for visiting Norwich Daily Photo and leaving your comments. Have a great week! nicely coloured church... must be more vibrant kung summer, may pag ka red kasi. sayang di mo na visit yung falls? at least there'll be a reason for you to come back. >uncleawang, the looks of the wood made it look natural in colors. one of the oldest but since it burned twice, then what remains to be old in that structure is its facade and the bell tower. >ac, kaya pala pinalaki ang simbahang ito. pansin nga namin na malaki talaga. we'll take note of that. pagbalik namin most likely hindi na tag ulan kasi waterfalls talaga ang isang lugar na dapat namin pinuntahan doon kaya lang umulan ng malakas. ganda ng probinsya ninyo. 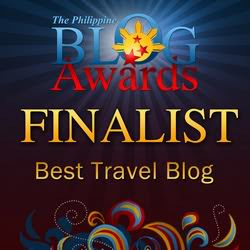 salamat sa pagdaan dito sa blog. salamat. nakabalik ka na pala. >pietro, my pleasure to share the beauty of this old church. >bryan, salamat! last year pa tong mga kuha nung magkasama kami ni lawstude. >eelwind, hahaha... maybe as you see it. >hi rayts, i too like brick-walled churhces. dami pang ganito sa bansa na kailangan kong makita. salamat! medyo tagilid pa nga kuha ko dun sa aisle kasi hirap tingnan sa maliit na screen. pero ok na rin kahit papaano. >hi ia, thanks! there's a lot to see around the philippines. there's a long list of churches that i have now that i wish i can visit. my pleasure to share the beauty of the place. >hi eunice, wow! that's great! just email me at i.dongho@gmail.com. ill give you options to choose. Ang ganda. Ang lamig sa paningin ng facade ng church. And the interior, maaliwalas ang dating. I especially like the wooden ceilling. ayos ang pic # 2 kuya dong. kakabasa ko lang din ng post ni kuya oman about this same church. eto pala pinuntahan nyo nung sabay kayong bumiyahe. Isa sa mga una kong ina-admire sa iasng church ay ang interiors nya. I love staring at its ceiling. Haha. u captured it in a good angle! nindot pod da. maayo pagkagama. 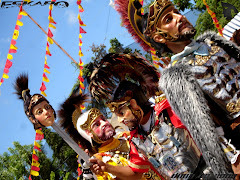 dong sinulog na hapit! galing galing naman ng kuha. nice post dong, keep it up! Hello kuya! pasensya na medyo busy ako kya di me agad nakakareply sayo. Baka pwde mong ifeature dito sa blog mo ung mga collections mo ng comics? san makakabili ng superman comics? wow, what a beautiful church. ang ganda ng blend ng kulay. my grand lola is from Nueva Ecija. abangan ko yun. yeh, I'm so back. 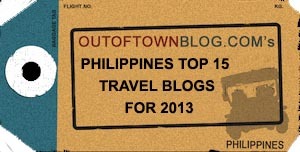 di lang ako nakapag paramdam agad sa blogs nyo, but I'll have my posts later.. mag blog hop muna ko for now. 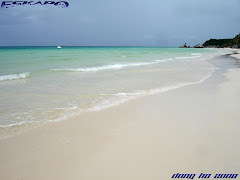 When I took a vacation here namamasyal pa rin ako dito once in a while, those photos of yours are wonderul and calming.. So I didn't miss any of it. That's a beautiful church. I also like the tree you shot so very much. 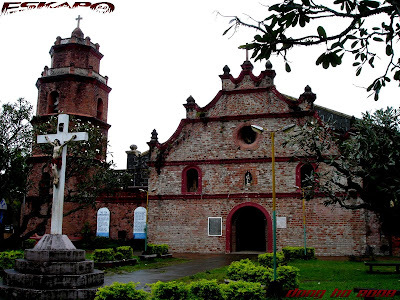 try barasoain church! sa malolos bulakan..equally stunning! ang husay ng shots! alamat ka! syet! galing! 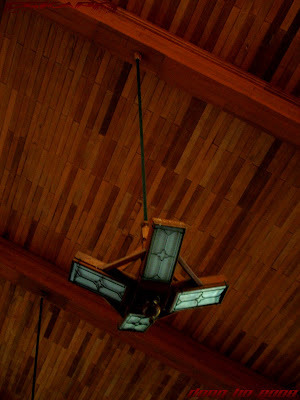 >blogusvox, i too like the wooden ceiling of this church. >beero, salamat. ito nga yung pangalawang beses naming pagsasama sa byahe. >tanchi, thanks! that's to hoping that the project push thru. >sendzki, ganda nga talaga dahil gawa sa kahoy. >hi mel, hehehe... i actually forgot. the interior of the church should really get along with the beauty of its external view. >hi myslykemeeh, thanks! the church itslef is already beautiful. >miong, nindot gyud sa sulod. hapit na bitaw. sayang dili ko ka anha. >hi iriz, thanks! im glad you like it. salamat sa pagbisita. >hi justkyut, meron pa ding binebenta sa filbars na mga comics. kaya pwede ka pa ulit mag collect. hanapin mo yung superman/batman ni jim lee. sana nga makapagbyahe ka na rin. nakapunta na ako ng pampanga. daming beses na rin dahil malapit lang. >dylan, salamat. saya nga at bumalik ka na. dami ding makikita sa nueva ecija lalo na sa northeast at southeast part nito. ganda ng probinsya. >erick, sana nga lahat kahoy. naging maganda na rin ito dahil nakailang tayo na dahil sa sunog. >hi carver, thanks. it's actually difficult to capture the whole church facade because of that tree but the tree itself has its beauty to display. >dencios, oo ganda din dun. nakapunta na rin ako doon kaya lang medyo matagal na at hindi pa ako nagbablog nung panahong yon. I am a sucker for red brick buildings. This one's to my liking a lot. And also the high ceiling is very appealing. I would enjoy being there. ganda naman ng mga pics! pakiramdama ko nasa tabi ko lng...tc lagi! Such a beautiful and mystical place. Thank you for sharing these wonderful shots! It looks beautiful inside and out. Its interior makes it conducive for reflection and prayer. >andy, salamat. the church is really beautiful. i like its interior. >photo cache, one fator that makes a church beautiful in its physical aspect is having a high ceiling. you'll definitely like this church. >pao, true. the simplicity makes it beautiful and it's well maintained. >hi helena, thanks! 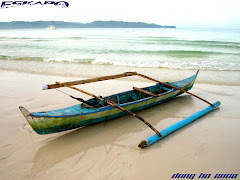 i hope that you'll be able to visit the philippines. >antoine, thanks! i like that kalachuchi tree too. >hi rachel, true plus the climate. you'll really have a good time for praying. >hi buninay, thanks! i appreciate that. Dong, how old this church. Nakpunta ako dito last December. Ang ganda. Maliit lang nga yung facade. It is cute in a sort of way pero dignified pa rin tignan. Pagpasok mo sa loob, may remains pa ng old part ng church(yung facade). May mga upuan din, mukha nga siyang chapel eh tapos may staircase (four steps lang ata) na papakyat from the old church part papunta dun sa main church. Ang ganda. May surprise effect kasi biglang lalaki ang interiors! 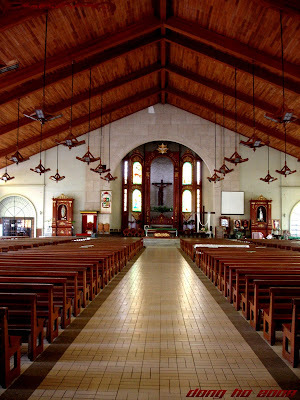 Maganda ang interiors nung bagong part ng church. May pagka contemporary ng konti but still retains the essence of timelessness. Hindi siya nagkaclash with the older style of the facade. Puro kahoy yung loob, ang ganda with the unique chandeliers that reminds me a bit of wooden windows with grill works. A must visit!